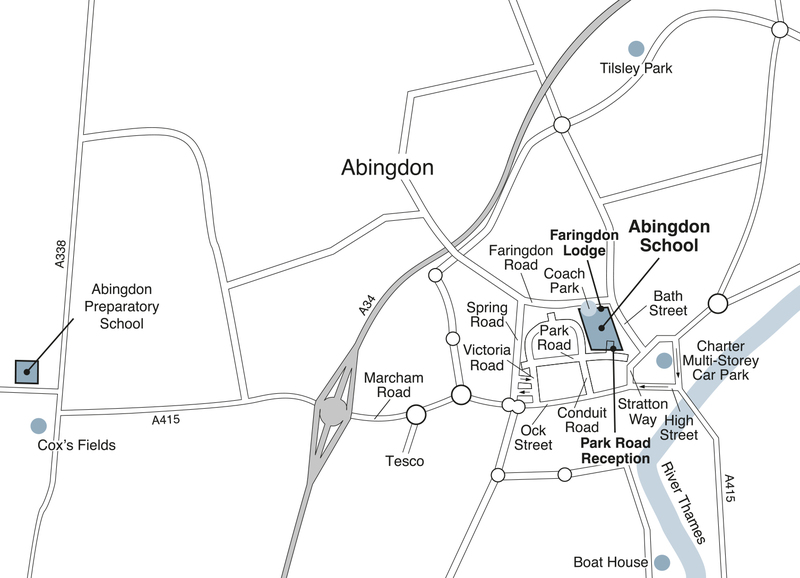 Abingdon School is situated in the centre of Abingdon, Oxfordshire and is best reached by road. The A34 runs close by, linking to the M4 in the south, and with Oxford and the M40 in the north. “How to find us” – with useful information for sports teams. There is very limited parking for visitors at Abingdon School, in addition the roads around the school are private and subject to parking fines. The Charter Car Park in the centre of Abingdon is a short walk from the school and is free for the first two hours. Street Map shows other parking close by. Sports matches are played at the Abingdon School site and in addition at Cox's Fields (Rugby, Football and Cricket) and at Tilsley Park - follow these links to Google Maps to get directions. Please note: when coming to Abingdon by coach, access to the school is via the coach park in Faringdon Road - OX14 1BQ - NOT by Park Road. 1st XI cricket is played on War Memorial field which is opposite the coach park on Faringdon Road, although car parking may be best done in the main school. Go to the major interchange with the A415 and leave the A34 following signs for Abingdon and Town Centre. Proceed for approximately one mile crossing three small roundabouts – Abingdon School is signposted, turning left into Conduit Road. At the crossroads with Park Road turn right. Visitors’ parking is in the car park on the right opposite the main reception. Cross the River Thames Bridge and turn left at the market place into the High Street. Move to the left-hand lane. Carry straight on following signs for Wantage, Newbury and the A34. Abingdon School is signposted, turning right into Conduit Road. The nearest rail stations are Oxford and Didcot Parkway. If you are coming from London, trains to both Didcot and Oxford leave from London Paddington. Didcot is the closer station to Abingdon. The train takes between 45 minutes and an hour from London. From Didcot rail station take a taxi (no need to book) to Abingdon. The taxi takes about 20 minutes (longer during peak travel times) and costs around £20. From Oxford there is a good bus service from the railway station. The bus is either a number 35, X3, X13 operated by the Oxford Bus Company or a bus 31 by Stagecoach and takes about 30 minutes and costs a few pounds. In Abingdon get off the bus at Stratton Way in the town centre and use the map above to find your way to Abingdon School. It is a short walk from the bus stop.